These days I’m playing a simple but interesting Pokemon with stats dataset. Unexpectedlly,the seaborn and matplotlib do not support the radar chart. And the matplotlib radar chart sample is totally a mass (186 lines, what the hell). 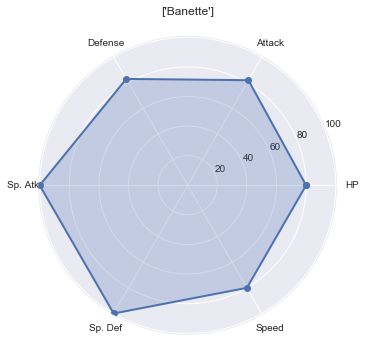 After an afternoon’s work I implemented the radar chart in a much simple way (only 20 lines). Hope this blog could help someone who is try to draw the radar chart in Python. Load libraries and pokemon dataset. Set the label of axis. (‘HP’, ‘Attack’, ‘Defense’, ‘Sp. Atk’, ‘Sp. Def’, ‘Speed’). Here we use the No.386 pokemon as an example to illustrate the chart. Here we should use the fig.add_subplot rather than the sns.plt.subplots(). (notice the “s”). Because the subplots doesn’t contain the argument “polar”. We can only set the polar axis by subplot. Then draw the plot as the frame and fill in the surrounded area by fill(). At the end set the label of axis and the title then everything done.